For other uses, see Crème fraîche (disambiguation). Crème fraîche (English pronunciation: /ˌkrɛmˈfrɛʃ/, French pronunciation: [kʁɛm fʁɛʃ] ( listen), lit. "fresh cream") is a dairy product, a soured cream containing 10–45% butterfat, with a pH of approximately 4.5. It is soured with a bacterial culture. European labeling regulations disallow any ingredients other than cream and bacterial culture. It is served over fruit and baked goods, as well as being added to soups and sauces. It is used in a variety of other recipes. It is less sour, more fluid, and fattier than U.S.-style sour cream, which may contain thickening agents. 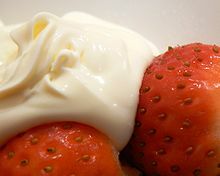 The name "crème fraîche" is French, but similar soured creams are found in much of northern Europe and a traditional soured cream used in Central America resembles it. 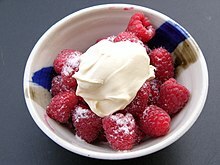 A literal translation of crème fraîche is "fresh cream". However, in French-speaking countries, crème fraîche may refer to either the thick fermented product, crème fraîche épaisse or fermentée, or to a liquid cream, crème fraîche liquide or fleurette. In these countries, crème fraîche without qualification normally refers to liquid cream, with the thick form usually called, crème épaisse. In other countries, however, crème fraîche without qualification, usually refers to the thick, fermented product. Crème fraîche is produced by adding a starter culture to heavy cream and allowing it to stand at an appropriate temperature until it thickens. The culture is made up of a mix of bacteria including, Lactococcus species L. cremoris, L. lactis, and L. lactis biovar diacetylactis. These bacteria give it the taste that distinguishes it from similar dairy products such as sour cream. Recipes for cooks making crème fraîche at home may substitute cultured buttermilk with active cultures for the starter culture. In some places in Europe, the fat content of crème fraîche is regulated and it may not contain ingredients other than cream and starter culture. In North America and the UK, products labeled "low-fat crème fraîche", with approximately 15% butterfat and with an added stabilizers such as xanthan gum or starch from maize or corn are commercialized. This product is less stable than crème fraîche when heated. The crème fraîche from Normandy is famous, and the crème fraîche from a defined area around the town of Isigny-sur-Mer in the Calvados department of Normandy is highly regarded. It is the only cream to have an appellation d'origine contrôlée (AOC), which was awarded in 1986. It also is produced in many other parts of France, with large quantities coming from the major dairy regions of Brittany, Poitou-Charente, Lorraine, and Champagne-Ardenne. Crème fraîche is used both hot and cold in French cuisine. It often is used to finish hot savory sauces and with its fat content greater than 30%, curdling is not a problem. It is also the basis of many desserts and dessert sauces. Crema Mexicana is a somewhat similar cultured sour cream that contains several other ingredients. Smetana from Eastern Europe and Russia is very similar also. In Romania and Moldova the product is called smântâna. ^ Mitzewitch, John (Creator) (24 March 2011). Homemade Sour Cream! How to Make Creme Fraiche (Video). YouTube. Retrieved 23 September 2017. ^ "Weight Watchers Creme Fraiche". Archived from the original on 27 October 2014. Retrieved 27 October 2014. Wikimedia Commons has media related to Crème fraîche. Lisbeth Meunier Goddik, "Sour Cream and Crème Fraîche" in Y. Hui Handbook of Food Science, Technology and Engineering (p. 179-6 to 179-7). Boca Raton, Florida: CRC Press, 2006. ISBN 0-8493-9849-5.